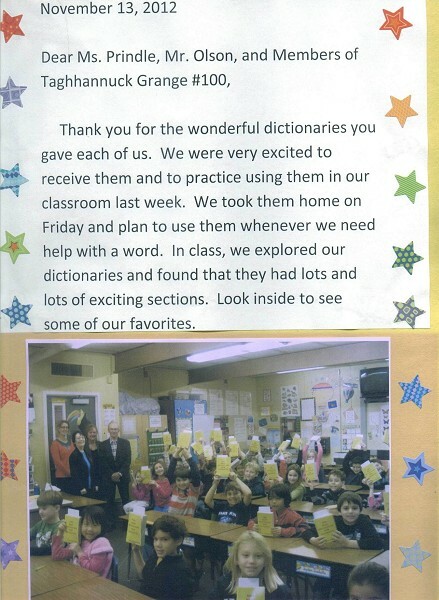 Nine years ago, the Taghannuck Grange, located in Sharon, adopted a program of the national Grange organization to provide new dictionaries, at no cost to the school or students, to all third-graders at Sharon Center School. 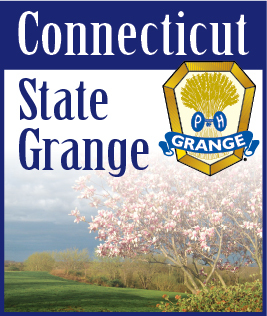 Barbara Prindle of the Grange said, “While this is a national Grange program, not all individual Granges participate.” Prindle added that as other area Granges stopped participating in the program, the Taghannuck Grange began donating dictionaries to the schools in their towns as well. Each year the Taghannuck Grange now donates dictionaries to students in Cornwall, Kent, Sharon and Warren. Before distributing the new dictionaries to students in Kent and Sharon, Prindle told the children about the Grange’s history and programs. While many people associate the Grange strictly with agriculture, Prindle said it’s an organization of people interested in farming, gardens, animals and the environment. Granges raise money for programs and charities and members come together to do community service activities such as delivering cookies to people who are alone at Christmas, taking holiday cards to people in nursing homes and maintaining a garden to help feed families in need. Each dictionary had a letter inside it so parents would know where it came from. There was no doubt the third-grade students were delighted with their new reference books. Makarewich told the students to take their new dictionaries home and look through them to find other learning aids. Each student wrote his or her name inside the cover after receiving the book. To this reporter, it was difficult to tell whether the students or the people from the Grange had more satisfaction with receiving or giving out the dictionaries. It was a win-win situation for everyone involved.